Small-dollar donors pushing for a sea change in November made Q3 2018 the biggest quarter in terms of dollars raised in ActBlue’s history. Grassroots donors raised $385,176,557 for 9,335 Democratic campaigns, progressive organizations, and nonprofits on ActBlue in Q3, more than double the amount raised in Q3 2016 before the presidential election. Q3 2018 also includes our three biggest dollar days ever: September 28th, 29th, and 30th. Small-dollar donors raised over $11 million (crossing the $10 million threshold for the first time ever) on September 28th, the day after Dr. Christine Blasey Ford testified in front of the Senate Committee on the Judiciary. The momentum continued over the weekend, with donors raising a staggering $16,853,013 on September 30th. And the records didn’t end there: Grassroots donors also made more donations in a single day than ever before on the 30th (307,320 contributions). All of this energy at the end of the month helped make September the biggest dollar month in ActBlue’s history, with $184,841,230 raised by passionate small-dollar donors. This money is coming at a critical point in the 2018 election cycle. Sixty-eight percent of the money we disbursed to campaigns and organizations on October 1st was sent via wire transfer, which meant campaigns and organizations could start to use it that day. This unprecedented small-dollar support is empowering Democrats to compete with Republicans bankrolled by mega-donors in the final weeks before Election Day, when GOTV efforts and ad buys can make all the difference. And the GOP is beginning to realize its super PACs can’t keep up with Democrats’ people power. We’re in the home stretch now, and there’s no telling how big the rest of this cycle will be — small-dollar donors raised more in Q3 2018 ($385,176,557) than in the entirety of the 2014 election cycle ($335 million)! 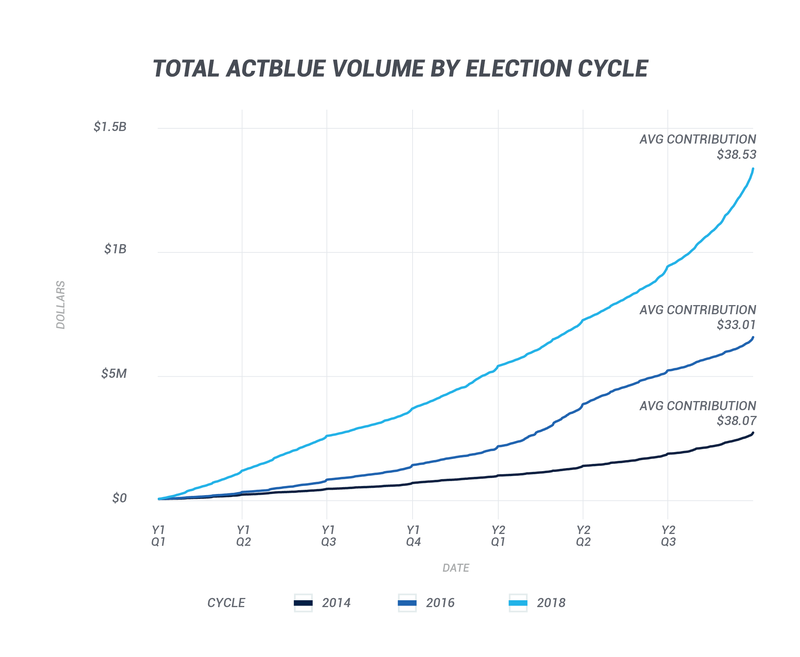 With $1.3 billion already raised on ActBlue this election cycle by 4.3 million grassroots donors and counting, it’s clear more people than ever before are participating in our democracy and making their voices heard. If you have questions about this post, get in touch with us at info@actblue.com. And if you’re looking to set up an ActBlue account for your group, contact support@actblue.com!